Further evidence that mytoddler daughter rules our kitchen - out of season strawberries in my fridge. 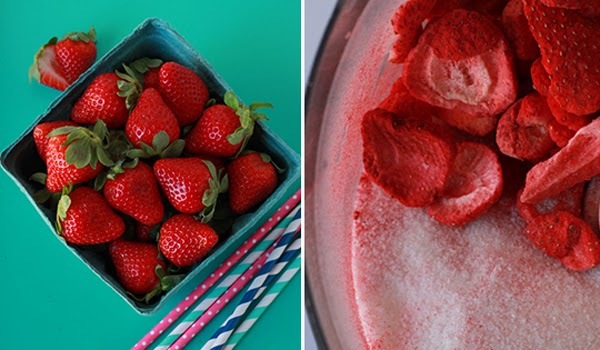 Strawberries have been a weekly addition to our shopping cart since December. I get it kiddo - at two years old you just love what you love and you aren't worried whether your berries are seasonal, local, organic, or even washed. Ella basically has a strawberry radar on full blast. One particularly ornery Saturday - she insisted on being outside of the shopping cart to help. Luck would have it that there was a strawberry display just inside the store entrance. She stopped mesmerized, "stawbewrries" she whispered. I was trying to find the shopping list, trying not to block the busy store entrance, and clearly not paying attention when a quart of strawberries was lobed into the cart by a toddler obsessed. That carton of strawberries burst open - all over the shopping cart and the store floor. I tried not to laugh as I scolded Ella. "Oh no, no, Ella we have to be gentle with our strawberries". I moved the shopping cart out of the way, smushing berries with the wheels, trying my best to let other shoppers in the door. And as I started picking up stray berries from the grocery store floor - another quart of berries hit the side of the cart to the cheer of "more stawbewrries pease!" I just lost it; I was in a full on giggle fit in the entrance of a very busy grocery store on a Saturday. We bought two pints of terribly bruised out of season strawberries that day. We also buy a lot of dried strawberries and freeze dried strawberries for snacks too. Ella has a dairy sensitivity that keeps her from enjoying store bought strawberry milk. 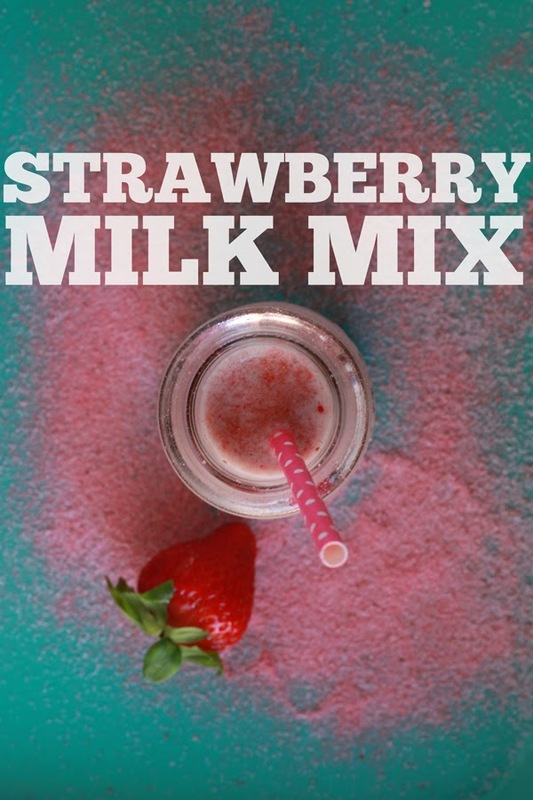 So I worked up this Strawberry Milk Mix to indulge Ella's strawberry obsessions and use up some of the freeze dried strawberries that start to get stale after someone leaves the package open. 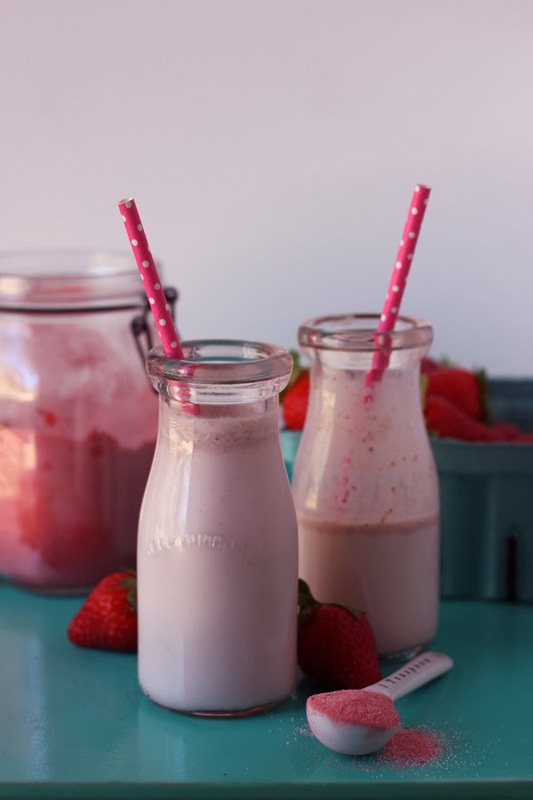 There are lots of recipe on the web for making strawberry milk with fresh strawberries (heck, there is even Strawberry Almond Milk to be made) but fresh strawberries don't last very long at our house and I wanted something that could be a quick anytime treat - not a drag out the blender and the strainer treat. 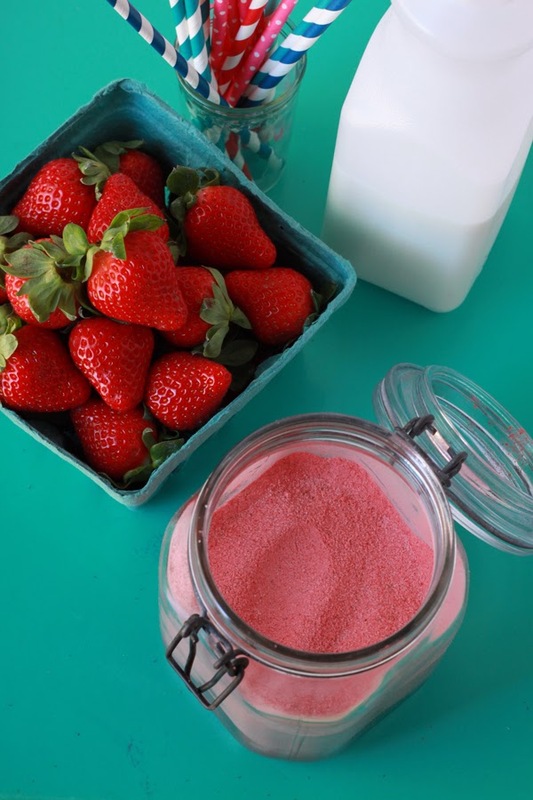 Pulse together the strawberries, sugar, vanilla powder, and salt in a food processor to a fine powder. Store in an airtight container for up to a month. 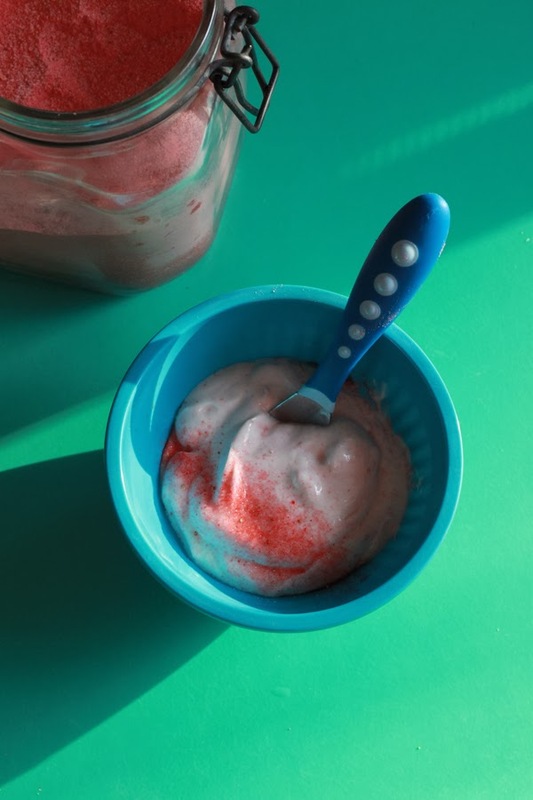 Combine 1 tablespoon of powder with 8 ounces of milk, almond milk, heck even yogurt and stir to combine well. Enjoy! This sounds so good for summer to me! And I may have to take you up on that coconut milk caramel recipe! I am going to try out the samosas this weekend. Keeping my fingers crossed for a good result! I'm sending you the recipe this morning! Can't wait to read how they turn out. whipped cream? strawberry whipped cream on really ripe strawberries?! you are genius Patty! How how how do you know all of these things? I am consistently impressed with your ideas and concepts. Ella is one lucky lady! P.S. I keep stalking your blog for the rebranding...I can't wait to see it! Ha! The new look will launch in March - trust me you will totally know it when it happens. And thank you! Unfortunately Ella is only impressed with me when I sing Thomas the tank engine songs. Hi Meghan! Thank you so much for sharing this recipe. 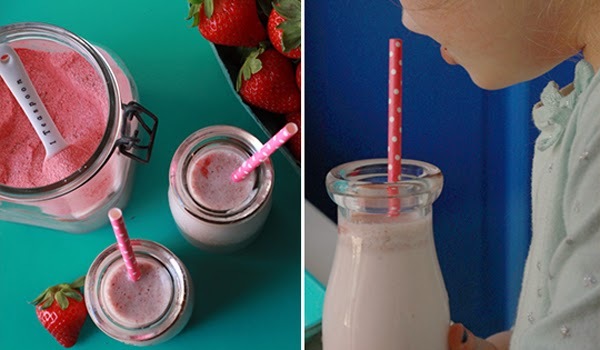 My boys love strawberry milk but I always deter them from it because most of it has red40 in it which we've been trying to keep out of our diet. Will certainly try your healthier method for this delicious treat. It was actually something I craved with my second pregnancy. Love you blog! So funny - I loved lemonade during my first pregnancy and ice (but only the publix soda fountain kind)! I hope you will try it - we are going to use it in some pink lemonade this summer for sure. And thank you for reading!